Margaret R. Yocom (Ph.D., English, University of Massachusetts, Amherst: 1980), a folklorist who specializes in family folklore, oral narrative, material culture, and gender studies, is associate professor emerita of English at George Mason University, Fairfax, Virginia. The founder of the Folklore Studies Program, she established the Northern Virginia Folklife Archive, the English Department’s Folklore, Mythology, and LIterature Concentration; the Folklore and Mythology Minor; and the Folklore Concentration in Master of Arts in Interdisciplinary Studies. Dr. Debra Lattanzi Shutika now directs the Program. Until her retirement in May 2013, Dr. Yocom taught courses at GMU in traditional narrative and storytelling, traditional arts, gender, ethnographic writing, and folklore and creative writing. Twice she received the George Mason University Excellence in Teaching Award. And, in honor of her founding of the GMU Folklore Studies Program and of her 36-year career there, the American Folklore Society awarded her the 2013 Kenneth Goldstein Award for Lifetime Academic Leadership. She has conducted fieldwork in her home Pennsylvania German culture as well as with the Inuit of northwestern Alaska and several Northern Virginia communities. Her major fieldsite is a North Appalachian mountain community in western Maine. She has published articles and photographs on ethnographic fieldwork, regional study, ethnopoetics, family folklore, gender, and material culture. 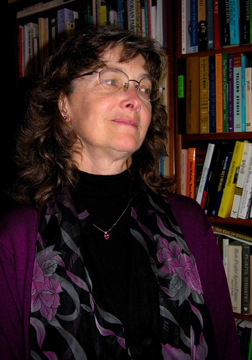 Her most recent work includes “‘We’ll Take Care of Liza and the Kids’: Spontaneous Memorials and Personal Response at the Pentagon, 2001″ in Spontaneous Shrines and Other Public Memorializations of Death (2006); “Exuberance in Control: The Dialogue of Ideas in the Tales and Fan Towers of Woodsman William Richard of Phillips, Maine” in Northeast Folklore: Essays in Honor of Edward D. Ives (2000); and “ ‘Awful Real’: Dolls and Development in Rangeley, Maine” in Feminist Messages: Coding in Women’s Folk Culture (1993). She is the assistant editor of Ugiuvangmiut Quliapyuit: King Island Tales (1988); and in 1994, she edited and wrote Logging in the Maine Woods: The Paintings of Alden Grant. She has published poetry in Beloit Poetry Journal and elsewhere; her creative non-fiction has appeared in Friends Journal. Her current folklore projects are two books: one on the storytelling of William Richard, one on the folk arts and storytelling of the Richard Family of Rangeley, Maine. Just published by Deerbrook Editions is her poetry book, ALL KINDS OF FUR— erasure poems that offer an alternative vision of a controversial Grimm Brothers’ tale (“All Kinds Of Fur”) which she translated. Active in public sector folklore, she serves as board member of the Rangeley Lakes Region Historical Society, Rangeley, Maine, as well as consultant to various projects at the Smithsonian Institution, the NEA, and the Maine Arts Commission. Until October 2014, she served as curator of the Rangeley Lakes Region Logging Museum. She also serves on the boards of the Maine Folklife Center and Western Maine Storytelling, and on the editorial board of the Journal of American Folklore. She co-founded the Folklore and Creative Writing Section of the American Folklore Society, and serves as liason between the American Folklore Society and the Association of Writers and Writing Programs. She lives with her husband, Dr. John F. Slack, an economic geologist of the United States Geological Survey (emeritus), in Farmington, Maine. She is honored to count among her former students at George Mason University, now colleagues, folklorists such as Paul Cantwell (Archivist, Dept of Justice), Sara Cleto (PhD candidate, Ohio State), Dr. Kristina Downs (PhD, Indiana), Paulina Guerrero (PhD candidate, Indiana), Kerry Kaleba (MA in Folklore and in Arts Management, GMU), Dr. Darcy Holtgrave (PhD, Missouri; also MFA poet), Dr. Jennifer Spitulnik-Hughes (PhD Missouri), Brittany Warman (PhD candidate, Ohio State), Chrissy Widmayer (PhD candidate, Wisconsin; also MFA non-fiction) and MFA poets such as Alyse Knorr, Matt Blakley, Sarah Colona, J. Michael Martinez, and Sheila McMullin. She is in their debt. Hello, my name is Kari and I believe that we may be related. My father and I were researching his family one day and we stumbled upon what I believe is your mothers post about the Michael B. Zwald family.My great-great grandmother was Margaret Zwald, his sister. They originated from Emporium, Pennsylvania and were Swiss. I hope this wasn’t a case and mistaken identity, and if it is I apologize for wasting your time. Hi, Kari. Great to hear from you, and apologies for my slow response. Yes, we may well be related! My great-grandfather Melchior “Michael” Balthasar Zwald emigrated from Nessental, Switzerland, and lived in Emporium. He was married to Margarette Fluman Zwald, also from Switzerland–my namesake. All of Melchior’s sisters, though, stayed in Switzerland. So–was the Margaret Zwald you mention really his sister? I am building a family tree on Ancestry.